Those are the first words of the headline on Rev. C. L. Keedy’s obituary in the Hagerstown Daily Mail of 25 March 1911. The paper made much of the gentle manner of Rev. Keedy’s passing. It was what used to be known as a “good death”: peaceful and without suffering. At the end of the Victorian period, however,”the evangelical model of the good death declined in influence. . . . The decline in Evangelical piety and passion in the late Victorian period was paralleled with an increase in anxiety about the physical suffering of dying” (Death, 53). Those who mourned Cornelius Keedy, Lutheran minister, physician and long-time president and proprietor of Hagerstown Female Seminary, could take comfort in the ease of his passing. This easy death might be taken as an indication that the longtime Lutheran educator had, in Christian terms, found his heavenly reward for an exemplary life. The obituary writer described him as “widely known” and “prominent in religious and educational circles;” the writer claims that “the news of his death produced a shock throughout the community”–but we really don’t know what kind of a man he was. Cornelius Keedy (1834-1911) was one of eight children born near Rohrersville, Md. to prosperous Washington County farmers Daniel Keedy (1799-1876) and Sophia (Miller) Keedy (1809-1880). Rev. Keedy graduated from Gettysburg College in 1857 and was ordained as a Lutheran minister in 1859. He served Lutheran congregations in Johnstown, Waynesboro, and St. Peter’s Lutheran Church in Barren Hill, Pa. He married Elizabeth Wyatt Marbourg (1840-1920), daughter of successful Johnstown merchant Alexander Marbourg, in 1860. In 1863 Keedy earned a degree in medicine from the University of Pennsylvania. He practiced, according to his obituary, for about five years in Washington, Iowa, where some of his wife’s relations had settled. But it was as president and owner of the Hagerstown Female Seminary, later renamed Kee-Mar College, that Rev. Keedy was chiefly known. The school, located at E. Antietam and King streets, had been established in 1853 by the Maryland Synod of the Lutheran Church. Keedy purchased it in 1878, and according to J. Thomas Scharf, “continued to improve it until it has become one of the most beautiful and attractive places in any of the middle states” (J. Thomas Scharf, History of Western Maryland, v. 2, 1882, p. 1159). The school had a fairly serious and ambitious curriculum for its young women, including ancient and modern languages, English literature, and music. Mrs. Keedy served as principal, and she may have also had a considerable financial stake in the school. F. J. Halm published a song entitled “The Hagerstown Female Seminary March,” dedicated to Mrs. Keedy, in 1877. Hagerstown Female Seminary was created as part of a wave of enthusiasm about women’s education that swept the Lutheran church after David F. Bittle published his 111-page “Plea for Female Education” in 1851 (Richard W. Solberg, Lutheran Higher Education in North America (Minneapolis: Augsburg Publishing House, 1985, p. 102). Rev. Bittle even resigned his pastorate to raise funds and support for the proposed school. After the college closed in 1911, the buildings were occupied by Washington County Hospital. The structures on the site were demolished in 2012, and the city is currently considering how to use the open space. 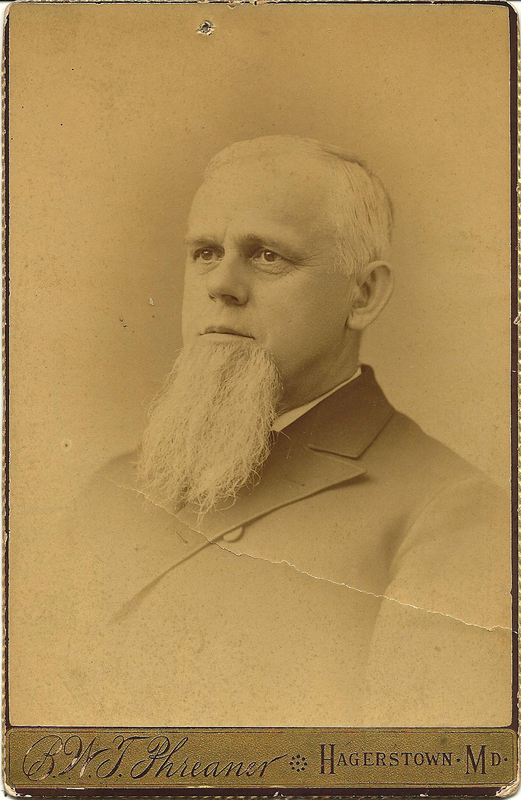 This cabinet card photograph, taken at the Hagerstown studio of Bascom W. T. Phreaner (1845-1932) is dated in pen on the reverse “1861-1862,” but Keedy’s white hair and wrinkles suggest a later date. Phreaner maintained a photographic studio in Hagerstown from 1866 to 1901. For this portrait, the photographer chose a vignetted, head-and-shoulders composition, with the sitter facing a quarter turn away from the camera. The pose created deep shadows above eyes that look slightly upward, as if Keedy were thinking about his many responsibilities: four children to educate and provide for, and a school full of 150 lively adolescent young ladies to watch over. Rev. Cornelius L. Keedy and Elizabeth Marbourg Keedy are buried in Rose Hill Cemetery, Hagerstown. Their children were Sarah (Keedy) Updegraff, James Marbourg Keedy, Wyatt M. Keedy, and Cornelius King Keedy. My thanks to the wonderful Washington County Free Library and to the Hagerstown Neighborhood Development Partnership for the research on Hagerstown Female Seminary posted on their blog [re]Develop Hagerstown. Nice article. Always great stuff. A few things. Phreaner’s studio was open from 1864-1907. That cabinet card mount looks to be from the 1890s. Thanks for writing about Bascom William Tell! My grandmother, May Caroline Ernst, was a student at Kee Mar College and I have a collection of books and photos relating to her time there (class of 1910). Some of these photos are on my flickr site “frogfarm”. I tried to find the photos on Flickr you mentioned, but I could not. Could you post a link or tell me the name so I could search for it? Great research as usual on Rev. Cornelius Keedy. Keedysville, which I assume was named after he or his family, is an adorable little town. We visit friends in Hagerstown and go through Keedysville whenever we get the opportunity. Thanks Janet! There must have been a connection between all the Keedys in the area . . . But I am not sure what Rev. Keedy’s relation to the village’s namesake is. Lucky you that you get to visit there!